This easy kamado BBQ beef burger recipe covers the cooking process to get the most out of your ceramic BBQ grill. Whether you own a "ceramic pot" or not however, start your quest for the perfect hamburger with my grilled hamburger recipes section on how to make the perfect hamburger. 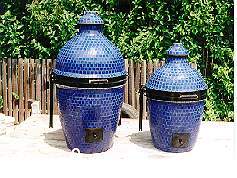 These ceramic barbecue grills aren't cheap but I have to say that since I bought my first one I have become a convert. They told me that the food comes out so much more moist and I really do agree, it's so much better than cooking on an open grill. First thing for this kamado bbq beef burger recipe, you need the heat deflector stone (so I hope that you bought this extra) and halfway through the cookout we're going to remove it and grill directly. Some kamado grills including Monolith, Kamado Joe & Primo have a handy split heat deflector stone which allows you to cook indirectly on one side of the grill and directly on the other. If you have this facility then great, you can set up each side accordingly and it saves you having to get the gloves on halfway through and remove the stone. The mix for this kamado bbq beef burger recipe is extremely easy because this recipe is more about the style of cooking than the actual recipe and to be honest, if the beef is good then the traditional salt and pepper seasoning is as good as it gets. Note:- the addition of salt to a burger actually helps with moisture retention much more than if you sprinkle salt on during or after the cooking. Place your ground beef in a bowl, mix in the salt and pepper and make the patties. The absolute must from a food hygiene perspective is that a burger should be cooked through and the technical capability of a kamado makes it just that little bit easier. If you have a two zone oval kamado then set it up with one heat deflector stone so that you can cook both directly and indirectly as shown below. Otherwise set yourself up for indirect cooking at a temperature of approx 120 - 140°C or 250 - 275°F, place your patties on the cooking grate over a drip tray, close the lid and cook for 15 minutes. This will ensure that your burger is cooked through but you'll notice that it's not crisp and caramelized on the outside and that's because the Maillard reaction doesn't take place until you are over 150°C (300°F). (It's the Maillard reaction that browns, caramelizes, crisps and therefore adds flavour). So to get that brown, crispy and tasty result that we're looking for it's now time to cook directly for 5 minutes on each side. With your oval kamado it's easy, just move the burgers over to the other side of your kamado otherwise get your heat resistant gloves on, remove the heat deflector stone and set up for direct grilling. Get your kamado to 250°C or 480°F and replace the patties on the grill. Close the lid and then flip after 5 minutes. Take care when opening the lid at these temperatures, lift the lid gently so that you don't get a rush of oxygen into the fire and flare up. Once flipped, close the lid again, shut the top vent and bottom damper and continue to cook for another 5 minutes. There you have it, the perfect kamado bbq beef burger recipe, so much better than simply grilling. TIP - Shutting the dampers on your ceramic smoker is a great way to keep food warm but in this case were using the residual heat to cook the burgers and also to concentrate that smokey flavor. 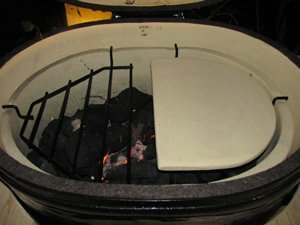 Just a word of warning though, don't leave food in a kamado that is sealed for long periods of time because smoke does go stale and will leave a bitter taste in your food. The technique I'm using here is OK for high temperature grilling but if you're cooking at low temperatures for long periods of time it's important to keep the smoke flowing.